Daniel Murphy’s Mets days are probably numbered, but he made sure last night that there will be at least a few more. Murphy pretty much was New York’s offense in their Game 5 win over the Dodgers, and backed by another excellent pitching performance from Jacob DeGrom, the Mets are through to the NLCS. Though celebrating fans gathered around the visiting dugout to chant “Re-sign Murphy,” the Mets don’t seem inclined to give him the eight figures a year he’ll probably command on the open market. The knocks on him have always been the same. He doesn’t hit for enough power. He runs himself into outs on the basepaths. His NLDS heroics, especially last night, seemed specifically designed to answer those. But it was Murphy’s baserunning that stands out. 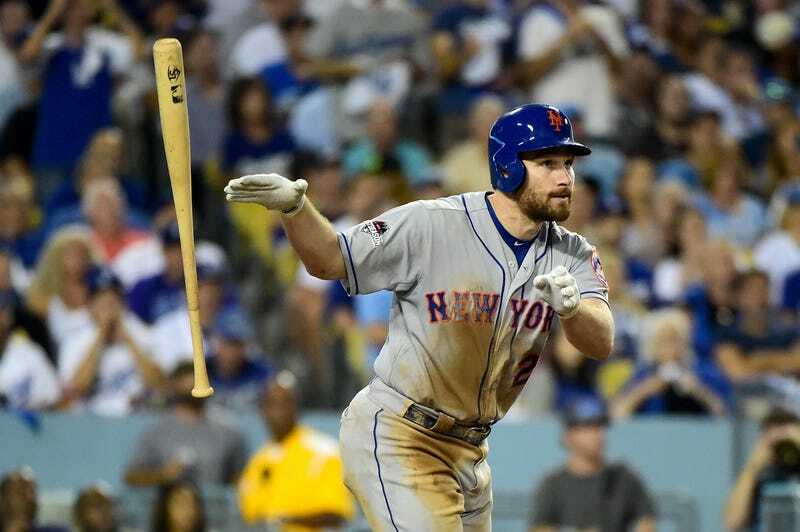 On first after singling, Murphy trotted to second on a walk to Lucas Duda. But the Dodgers had overshifted, and about halfway down to second Murphy realized no one was covering third. Murphy said the hardest part was keeping his cool going from first to second and not speeding up. If he had sprinted, the Dodgers would have realized what was up and called time. Instead he stuck to his lope, only breaking into a gallop once he reached second. It went down as a stolen base, and Murphy scored the tying run on a sac fly (that Andre Ethier probably should have let drop foul). Murphy will never be a superstar. He’s a versatile but questionable defensive player with a little pop and an aggressive runner who’s a danger on the bases to both opponents and his own team. But the love-in from Mets fans has been a long time coming because, like them, Murphy has been through the tough times. He’s the second longest tenured player on the team, and throughout his career the Mets have constantly been looking for someone better. This postseason will do wonders for his free agency offers, but however it ends, it’s also a deserved victory lap.